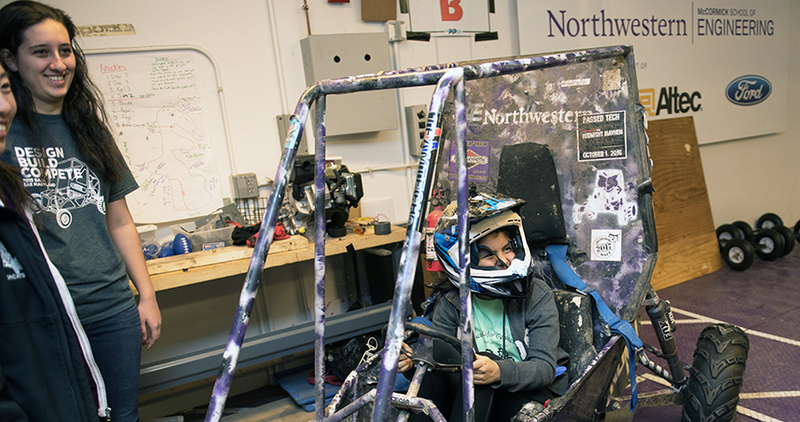 Members of Northwestern's Baja team tell participants about the process of building a car. Career Day participants build a contraption during the day's design competition. Participants test their hand-made devices during the design competition. One laboratory tour included a presentation about prosthetics and orthotics. With help from a graduate student, girls complete an experiment to learn about chemical reactions. A participant assists Professor Arthur Schmidt with a physics experiment. The career and educational workshop is designed to encourage young women to consider engineering in their education and career choices. Held the last Saturday in February each year to end National Engineer’s Week, the event is sponsored by Northwestern’s McCormick School of Engineering and the University’s chapter of the Society of Women Engineers. The popular event included an engineering design competition, laboratory tours, hands-on experiments, a goal-setting workshop focusing on different engineering majors, and separate panel discussions for high school students and parents. Throughout the day, young women met current female engineering students, faculty, and alumnae. Danielle Tullman-Ercek, associate professor of chemical and biological engineering, kicked off the program with a keynote address. A member of Northwestern’s Center for Synthetic Biology, Tullman-Ercek builds biomolecular devices for applications in bioenergy, living batteries, and drug delivery. The laboratory tours included opportunities to design a molecule using computational chemical engineering, to view atoms under a microscope, to use computer simulation and animation to design optimal travel routes, to learn about building cars, and to observe a series of phenomena which seem mysterious and even magical.